Dr. César Márquez-Chin’s main research objective is to enhance the safety, independence, and quality of life of individuals with disabilities through technology. During his doctoral research, Dr. Márquez-Chin created multiple brain-machine interfaces – devices that use brain signals to control electronic devices. The systems he implemented can identify different hand and arm movements through detailed analysis of the electrical activity of the brain, control neuroprosthetic devices to restore movement after paralysis, and drive computer cursors. This work, which pioneered brain-machine interfacing using intracranial electrodes in Canada, was conducted under the supervision of Prof. Milos R Popovic. 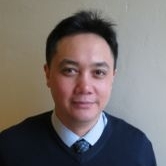 Dr. Márquez-Chin holds a scientist position at University Health Network Toronto Rehabilitation Institute where his laboratory continues to develop neural interfaces, exploring how these technologies can be used to assist in the diagnosis, treatment, and rehabilitation of neurological conditions. Participating in the development of assistive devices that are commercially available, Dr. Márquez-Chin has also been part of teams that provide direct clinical care. In addition to his activities dedicated to the creation of assistive devices, he is actively involved in the development of technology to support care providers and control infections in clinical settings.